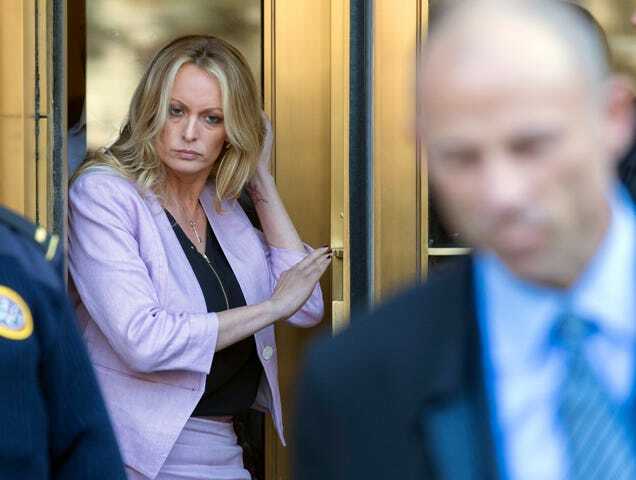 Adult-film actress Stormy Daniels follows her attorney, Michael Avenatti, as she leaves federal court on April 16, 2018, in New York City. It looks as if the bumbling and untruth-filled presidency of Donald Trump has met its match in an adult-film actress and her lawyer. Reason being? Media moxie. Clearly, Stormy Daniels (real name: Stephanie Clifford) and her lawyer, Michael Avenatti, are playing up their case against the president with perfect precision. Daniels alleges that she had a tryst with Trump and was paid $130,000 by Trump’s lawyer Michael Cohen to keep it on the low, possibly violating campaign-finance laws. Cohen is currently under federal investigation, and Daniels is suing the president for defamation. Then, on Sunday morning, The Guardian published a recent interview with Avenatti (who also got his own shoutout for media whoring during the SNL news segment) in which he predicted that this president is going down (don’t even go there), but not through impeachment. The formidable lawyer and Daniels (who not too long ago was featured on 60 Minutes) continue to dangle what many hope will be a smoking gun before the public. In the interview, Avenatti also took pot shots at Trump’s last, desperate attempt at decent legal counsel for his everlasting fuckups, coming up with former New York City Mayor and sputtering geriatric Rudy Giuliani, whom the president brought onto his legal team less than a week ago. It has been chaos ever since. There is no confusion here about what this presidency is headed. We hope.